An unheated PVC hoophouse can be a useful addition to your garden. It keeps excessive rain off the plants, blocks the wind, raises daytime temperatures 5-10 degrees (and often much more), and keeps frosts and heavy dew off the leaves. This can extend your warm-season gardening a month or more at both ends, and makes it possible for year-round gardeners to grow a wider variety of plants through the winter. PVC hoophouses are inexpensive to build, and can be put up in about an hour. Take a look, and decide for yourself! 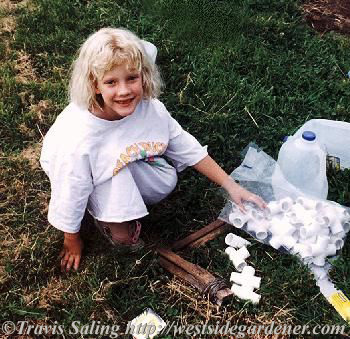 Before getting started, you need to mark out where in the garden your hoophouse will be placed. The diagram to the right gives you the distances for the hoophouse I am describing; but you can easily modify it to the size you need. As described, this 10’x21′ PVC hoophouse will be roughly 7′ tall in the center. 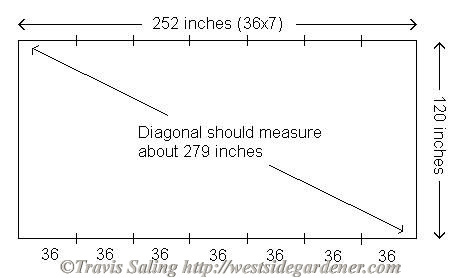 To ensure that the sides are all parallel and square, measure across the diagonals: Both distances should be the same. The first thing to do is collect all your separate parts. The construction will go much quicker if you have a helper. Drive a stake into the ground every 36 inches along the two sides (this is much easier if you cut the bottom of the stake at an angle). Try to get them as straight up as possible. I find it easiest to put up all the separate hoops first, then connect the ridge afterward. Each of the two end hoops is made using two 10′ lengths of 3/4″ PVC, joined with a PVC tee. The other six hoops use the PVC crosses in place of the PVC tees. Since I like to be able to move the hoophouse around the garden from season to season, the joints are dry-fit together (no glue). They seem to stay together, especially if I use a rubber mallet to snug up all the connections. Optional step: I have found that the joints mentioned above are sturdier if I reinforce them internally, by inserting a 1-foot length of 1/2″ PVC through the joint. These pieces seem to fit through a 3/4″ PVC tee okay; but you may have to drill out the PVC crosses in one direction, using a 5/8″ spading bit. This can be tricky, so be sure to clamp the cross down well BEFORE attempting to drill it out! 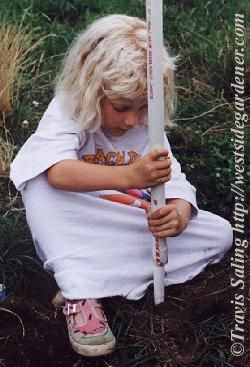 The two ends of each hoop slide easily over the 1/2″ PVC stakes. If the stakes aren’t in the ground perfectly straight, don’t worry about it; the pressure from the hoops tends to even out their alignment somewhat. When setting up the hoops, having that helper around REALLY makes things easier. The next step is to connect the ridgeline. 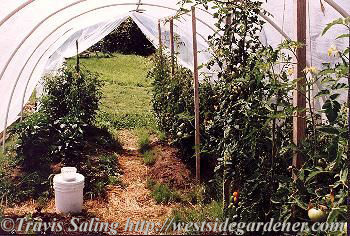 Starting at one end of the hoophouse, connect the hoops at the top, using the 34-inch sections of 3/4″ PVC. As I go, I like to use the rubber mallet to set each section as far into the connectors as possible. Note that the ridgeline will be slightly shorter than 21 feet, for increased stability. Congratulations! You have finished the frame! 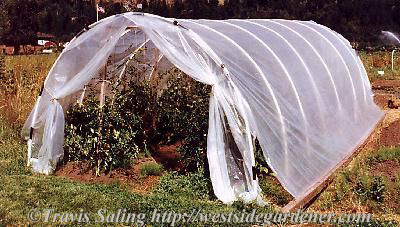 The plastic sheeting can be secured to the frame in many ways. 8-inch lengths of 1-inch black poly pipe can be slit lengthwise, making clips which can hold the plastic onto the PVC frame. A slightly more expensive solution is to use large binder clips, which can be found at any office supply store. I like to sandwich the sides of the plastic with 2×4 lumber, screwed together. When it gets windy, this extra weight holds the plastic down much better than the clips alone. All sorts of heat-loving plants thrive in a hoophouse environment, including tomatoes, peppers, and, unfortunately in this case, horsetail. This goes much easier if it’s done before the frame is “skinned” with the 20’x25′ plastic sheet. Cut the 10’x25′ piece of clear plastic to make two 10’x12.5′ pieces. Take one, and lay it over one end hoop of the PVC hoophouse (the 10′ measurement should be vertical), such that the hoop is completely covered, but at least one foot of plastic is on the ground. Use the poly pipe clips to secure this plastic end piece to the hoop. Cut a slit down the middle to make the door. There will be some excess plastic, which can be cut off if desired. That’s it! Repeat this at the other end of the PVC hoophouse. These “doors” can be tied open with twine, or held shut with weights such as bricks or water jugs (which is why that extra foot of door, laying on the ground, is necessary). It has been my experience that the poly pipe clips do not hold well if they are used over two layers of plastic. So I use the poly clips to secure the end pieces to the end hoops, and then hold the walls in place using the large binder clips. Although I use the more inexpensive PVC for the 3/4″ ribs, I have found it worthwhile to purchase the heavy gauge 1/2″ PVC for the stakes. When the wind catches the hoophouse broadside, the stakes experience a lot of stress at the point they enter the ground. The thicker the wall of the pipe is, the less likely it is to break. One gentleman wrote and suggested inserting Rebar inside the stakes, which certainly would be worthwhile in an unusually windy location. Since any stress on the ribs is spread over their entire length, there isn’t much point in getting the thick-walled 3/4″ PVC. Also, the thicker PVC will be less flexible, and in addition it may not fit over the 1/2″ pipe used for stakes and reinforcement. In most cases, I have found the weight of the 2x4s (used to hold down the plastic) sufficient to keep everything in place. People in very windy spots may need to further secure these either with ground anchors or by pounding Rebar into the ground (using it as you would a tent stake). In case it isn’t clear: All clamping with binder clips or home-made poly pipe clips is at the ends of the hoophouse (at the ends of the plastic sheeting, in other words). Putting them in the middle will just guarantee that you will lose them as soon as the wind rises. It’s also a good idea to clamp the plastic while it is dry – even a thin film of water between the plastic and the PVC pipe greatly decreases the holding power of any clamps. The most commonly asked questions are answered in the FAQ about the PVC Hoophouse. 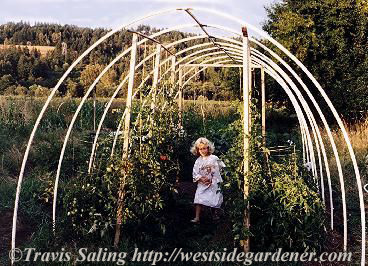 The author has no association with Hoop House Structures, Green Winters Hoophouse, or any other manufacturer of commercial hoop house or greenhouse structures, design kits, or plans.